For use with a handmade house or one of our ready-made chalets. 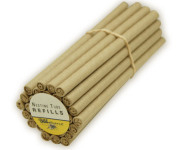 These 100% recycled cardboard nesting tubes are attractive to Mason Bees and make a great nesting material. You get 10 tubes in a pack. The tubes are a one-time use, so once used the bees have hatched out they should be discarded. Replace as soon as possible to keep your bees happy. Unoccupied tubes (tubes with no plugs) are re-useable. Hanging out a nesting box is a little bit like putting up a bird house to make housing available for wildlife. The tubes act as a nursery for baby bees. Remember, if you don't have a good habitat (spring flowers and palces for adult bees to hide), your bees may not stick around. To ensure the house is used you can add a box of Mason bee cocoons to hatch out. Here in northern Alberta (where our Lab is), bee cocoons must he harvested and kept in more stable temperatures during the winter than our taiga climate can provide. If you live in more friendly climates this may not be necessary. For more information, contact our office.